We’d love your help. 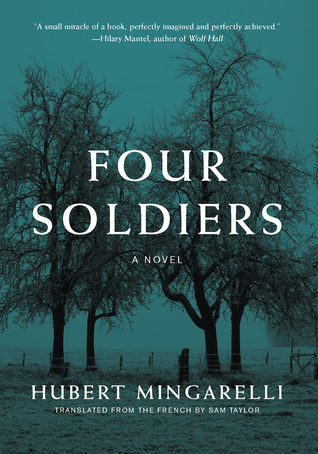 Let us know what’s wrong with this preview of Four Soldiers by Hubert Mingarelli. To ask other readers questions about Four Soldiers, please sign up. I hoped to enjoy this book better than A Meal in Winter. There are things here that appeal to me. Eastern Europe. A wandering army living outdoors and doing simple activities much as people have been doing for centuries, if not millenia. And the last few months, I've been reading other books about Russia in the first half of the 20th century. It is 'literary fiction' because not much happens for 90% of the book, rather than because of exceptional 'literary' qualities. The descriptions are mostly flat. No linguistic fireworks or breathtaking vividness here. The apparent lack of intertextuality (though I accept I may have missed something) is frustrating and boring. For instance, can this really be a literary novel if it's set in early 20th-century Russia, with a narrator called Benia, yet no similarity or allusion to Isaac Babel's Benya Krik? Political and cultural history is too much absent here. Yes, historical references in fiction can sometimes feel forced, and yes, at many times, ordinary people would not necessarily have thought about politics a lot. But these are Red Army volunteers, and there's nothing here about why they signed up. No mention of Lenin nor Stalin (the latter was a general in this war). The absence of politics made sense in A Meal in Winter and tallied with the Nazi-soldiers-as-ordinary-men historical narrative. The same doesn't wash for Four Soldiers. Perhaps the simple style can be seen as reflecting the first-person narrative of an ordinary man? But, mostly, Four Soldiers lacks the immediacy, the rawness, and haphazardly creative metaphor of real people, such as Svetlana Alexievich's interviewees for The Unwomanly Face of War (who fought in WWII). It's more writerly than gritty. The soldiers' indifference to one another's identities seemed overly utopian. Benia was very much a Jewish name, there were many pogroms in Russia at this time, and Jewishness is never mentioned at all. Katya's review goes into more detail about the implications of the men's ethnicities at this time in Russian history. The narrative also hints that one of the soldiers is gay, but this never seems to consciously occur to the other men. The improvement in writing at the dénouement evoked some genuine emotion, but not so much as to totally override my bored cynicism; through the earlier part of the book I'd been thinking "I bet it'll go a bit Blackadder at the end" (i.e. Goes Forth final episode). I had already sat through enough mild tedium and general lacklustreness, and enough marginally promising descriptions deflated by clumsy following sentences, that it couldn't change my feelings about the book as a whole. Whilst the style and brevity of this novella is suitable for some situations, overall I feel it is a shame that so many people will spend time reading this instead of older Russian works by writers who were there, or at least whose fathers or grandfathers were. This sort of historical novel on a common topic seems like a new book for the mere sake of new books and the sales cycle. The narrator's sensitivity - towards his mate Pavel's recurring nightmares- is intriguing. At first I took it to be a potentially anachronistic projection of contemporary Western attitudes, as men are becoming more emotionally open with their friends (though people of all eras vary). He was not much like the men described in Unwomanly Face of War. I asked a Russian friend about it; she explained that men brought up in late Imperial times are often thought to have been more sensitive, while masculine culture hardened later due to mass repression and imprisonment, and that has never really gone away ("a Russian man can only be sensitive if he is intoxicated" was her verdict on the current situation). Whether or not the author had researched Russian assumptions about men of the past, it was interesting to hear about this. Author, Hubert Mingarelli, pulled me aside for a trip back in time to revisit the Russian Civil War; the year was 1919. It'd been the one clash between nations I knew so little about - until now. Exceptional credit is extended to Sam Taylor who did a fabulous job of translating this novel from French into English. I can't begin to imagine the effort that that took. Well done Sam. The morose, panic-stricken scenes were an actual testament to the slow decay of the mind when subjected to the endless Author, Hubert Mingarelli, pulled me aside for a trip back in time to revisit the Russian Civil War; the year was 1919. It'd been the one clash between nations I knew so little about - until now. Exceptional credit is extended to Sam Taylor who did a fabulous job of translating this novel from French into English. I can't begin to imagine the effort that that took. Well done Sam. The morose, panic-stricken scenes were an actual testament to the slow decay of the mind when subjected to the endless pitfalls of combat troops in war. Life as they had known it slowly dragged on one impossible day at a time. Four soldiers met up and became best of friends while they were attached to the Red Army and fought on the Romanian front. Times were beyond difficult; they were unbearable. In order to survive, they were forced to eat their horses and scavenge whatever food and provisions they could gather from local homes they passed along the way. The days were bitter cold, the night's intolerably freezing. That was cause enough for the war to take a break and wait it out till spring. It would not go away. With the rest of their company, the four comrades built a hut for themselves and made camp hidden away in the middle of a forest. They did whatever they could to occupy the endless days and nights. Mindless hours of shooting dice for cigarettes helped ease their troubled minds. Clear days were spent sitting by a pond concealed from the rest of their company within the reeds. They knew their time was running out. War would not let go. As always, time had a way of marching on, and in their case, too fast. Spring had finally arrived and it was time for them to pull out, time for some to sacrifice their lives for a cause they could not begin to comprehend. All that waited ahead for them down the dirt road were bullets and bombs. If lucky, their demise would come quickly. Paul Falk Fred wrote: "Nice job Paul!" Judy Beautiful review, as eloquent as the book itself. Four Soldiers has been translated by Sam Taylor (also translator of Lullaby) from the French original Quatre soldats by Hubert Mingarelli. The same author/translator combination was responsible for the IFFP longlisted, A Meal In Winter. Four Soldiers tells (clue is in the name) the story of four soldiers fighting in the Red Army during the Russian Civil War, but the focus in on their interpersonal relationships, and indeed there is no sense of place whatsoever: this might as well be set in any time or place, although perhaps that is Mingarelli's point, that the experience of soldiers in war, the bewilderment but also the fellowship, is universal. As the novel opens, winter is setting in, and their division retreats from the front with the Polish army, to build huts and hunker down for the spring. Four soldiers come together to do so - the narrator Benia, Pavel already a close companion of his, an Uzbek giant Kyabine, naive but strong, and the rather introverted Sifta, the last to be chosen due to his reliability and lack of causing any issues. When we’d finished building our hut, we proudly contemplated it in the light of the fire that burned at the center of the clearing. We walked all around it, congratulating one another, and then all four of us went inside and I thought to myself: That’s it. I’m not alone in the world any more. And I was right. We were out of the forest now. Winter was over and it is difficult to imagine how long and cold it had been. We could each and all meals and all horses, and many of our men had died in the forest. i looked at the confident smile on Sifra's face, because Kyabine was leading the horse at the right speed. And I watched Kyabine's slow, reassuring gait, and Pavel was there too, walking next to me, and suddenly I was filled with emotion because each one of us was in his place and also because it seemed to me that in that instant that each of us was far away from the winter in the forest. And that each of us was also far away from the war that was going to start up again because the winter was over. And the end of the novel is rather predictable although nicely done. Ultimately a light and easy read, perhaps moving if one is in the mood, nicely but too simply written and with an odd lack of a sense of time and place. I know that I'm not the only one who, after reading the description of Four Soldiers, thought that the premise sounded curiously similar to that of Minagarelli's previously published novella A Meal In Winter that tells the story of a group of German soldiers during WWII and which has received pretty mixed reviews from the book bloggers that I follow. I haven't read A Meal in Winter, but I was intrigued to read this novella since it's one of the contenders for the 2019 Man Booker International prize. Written in concise, minimalist prose, Four Soldiers by Hubert Mingarelli, translated from the French by Sam Taylor, follows a group of Red Army soldiers who are stationed near the Romanian border during the Russian Civil War (1917-1922). This emotionally subtle novella is narrated from the perspective of one of the soldiers, a young volunteer named Benia, whose detailed observations of his fellow army comrades - Pavel, Kyabine, and Sifra - provides us with a glimpse into the harsh realities of warfare. Not much happens in the book as it mainly focuses on their daily interactions and activities, while they are waiting for their new orders. Despite the complicated relationship dynamics between the four soldiers, they find solace, and even some joy, in their comradeship and the idyllic moments that they spend fishing, swimming, drinking tea, and playing dice for cigarettes. All these routine activities help to ease their anxiety over what is to come since they're well aware that they can't escape the war. The soldiers are later joined by another recruit, a young peasant boy named Kouzma, who they refer to as the "Evdokim kid". At first, they are reluctant to accept him into their tight little group, but they become intrigued by the kid once they discover that he spends a lot of time writing in his notebook. It soon becomes clear that he is the only one in the group who is literate and the other soldiers urge him to record in detail the brief, peaceful moments that they have shared together before they are thrust into the horrors of the battlefield. "Listen", said Pavel, not looking at the kid but lying motionless and staring at the surface of the water, "if there's one thing that you ought to write, it's that we're all sad because we have to leave and we won't be able to come back here." The kid opened his mouth but no sound came out. "Did you hear me?" Pavel asked him. The kid nodded and Pavel went on: "Yeah, say that we're all sad because we had some good moments here, some really great moments, and we know that we won't have any more, and where we're going there won't be any good moments, because all that is behind us now." It's a moving examination of the psychological effects that the uncertainties of war have on the minds of these young men. The language is simple, but it seems to fit the narrative very well. So, why the 3-star rating? Well, my main issue with the book lies in the lack of a strong sense of place. The Russian setting never came to life for me, since there are no distinct cultural, political or historical details that would ground the story in that turbulent time period of early 20th-century Russia. Also, considering that the author chose to give these characters such unusual names, I was surprised and puzzled by the fact that he completely avoided exploring the men's identities and ethnic backgrounds. If that was deliberate, I'm not quite sure what point the author was trying to make. In my opinion, that would have made the book much more interesting. I like this premise, and I’m much more keen to read a war novel that deals with the human relationships rather than one focusing on the brutality of war. A slight tangent, but I find myself zoning out whenever there are scenes of shooting, chasing, dueling or whatever in movies, so in that respect I was in safe hands with Mingarelli’s short novel. But in terms of characters, it feels to me that Mingarelli is relying a little too heavily on stereotypes. The Uzbeki soldier is obviously the strongest of the four, and of course there has to be an annoying yet confused young officer who shoots a mule right in the beginning: “He was a young sub-lieutenant and he looked on the verge of tears.” The problem here is that I automatically visualize it all in terms of some big-budget movie I would rather not watch. I love books that show, in a concise, realistic but subtle way the horrors that the war inflicts upon the psyche. And Four Soldiers achieves this in a remarkable way. The way the four boys bond left my heart in shatters. Pure, concise humanity. But there was a downside. As someone from Russia, I found quite a few things to indicate poor research done on behalf of Hubert Mingarelli. And honestly, I’m perplexed. This book could have easily been set in any (civil) war in the world’s history: which I love books that show, in a concise, realistic but subtle way the horrors that the war inflicts upon the psyche. And Four Soldiers achieves this in a remarkable way. The way the four boys bond left my heart in shatters. Pure, concise humanity. But there was a downside. As someone from Russia, I found quite a few things to indicate poor research done on behalf of Hubert Mingarelli. And honestly, I’m perplexed. This book could have easily been set in any (civil) war in the world’s history: which is further shown by the film version, where the civil war is fictional. Why did Mingarelli pick Russian civil war, and why did he not bother to do the research on very few things? I mean, it seems like he did, because the geography rung true, but some things were very distracting, and easily fixed by a bunch of wikipedia forays. Another superb short novel about men at war by this excellent French novelist. This time Mingerelli tackles the Russian Revolution, following four soldiers from the Red Army as they battle winter, boredom and the looming dread of what is to come. They form tight friendships as they while away the hours playing dominoes, talking or just sitting by a secluded pond. Mingerelli does such a superb job of depicting the base daily events of soldier life. He strips away the politics, refuses to take side Another superb short novel about men at war by this excellent French novelist. This time Mingerelli tackles the Russian Revolution, following four soldiers from the Red Army as they battle winter, boredom and the looming dread of what is to come. They form tight friendships as they while away the hours playing dominoes, talking or just sitting by a secluded pond. A haunting story of four soldiers during the Russian Civil War 1919. There is a lull in fighting and the men find time to rest and enjoy the simple things - eating, smoking, drinking tea, being together, having shelter, washing and not thinking of the dangers of the war they were in. They share a pendant, which has a photo of a woman in it, and each night one of them get to sleep with "her". Another soldier carves hands and sells them to men looking for some solace. Mateship is a strong theme. Wh A haunting story of four soldiers during the Russian Civil War 1919. There is a lull in fighting and the men find time to rest and enjoy the simple things - eating, smoking, drinking tea, being together, having shelter, washing and not thinking of the dangers of the war they were in. They share a pendant, which has a photo of a woman in it, and each night one of them get to sleep with "her". Another soldier carves hands and sells them to men looking for some solace. A simple story about men at their most vulnerable and where friendships are forged amid common fears and shared enemies. The Red Army were a mixed bag of illiterate peasants and working class men who were mobilised to secure the rewards of the people’s revolution. The story takes place during the Russian Civil War in 1919. The troops are close to the Romanian front in retreat and seek sanctuary in local forests to see out the harsh winter. Those that had survived skirmishes with the enemy now die A simple story about men at their most vulnerable and where friendships are forged amid common fears and shared enemies. The Red Army were a mixed bag of illiterate peasants and working class men who were mobilised to secure the rewards of the people’s revolution. The story takes place during the Russian Civil War in 1919. The troops are close to the Romanian front in retreat and seek sanctuary in local forests to see out the harsh winter. Those that had survived skirmishes with the enemy now died from the freezing temperatures or from hut fires trying to keep warm. Food was short and the land not plentiful nor the isolated farms abundant to share their produce. The book is the memories of one soldier many years later about his experiences. Fundamental to his survival appears to have been the relationships forged between his fellow combatants. He is drawn to Pavel and they were joined by a giant of a man, Kyabine and a quiet soul Sifra. During this hiatus from fighting and having endured the worst of the winter these four spend their time together. It isn’t free from bad dreams or the fears rejoining the slaughter but in the basic things they do a certain poetic harmony is created. I enjoyed Hubert Mingarelli’s brilliant ‘A meal in winter.’ So I was pleased to have the opportunity to read this book. The simplicity of the men’s conversations, their daily routine and chores were engaging and completely engrossing. The author says more by what is unsaid and much is inferred in quiet moments and the men’s need for special places like a local pond they strive to keep as a secret location just for them. The relationships are later initially strained, when a young child volunteer is assigned to their care. In the end his presence is enjoyed in that he records their antics in his notebook. The thoughts that these days are recorded in writing seems to make them more alive and validate their current situation. The dialogue is basic but borne out of conflict and confinement. It rings true and pierces the heart of the reader. You realise their lives are on hold and their future is not within their own making. It makes their simple happiness almost childlike, their superstitions real and their desire to remain by the pond understandable. I think it speaks loudly to all who would hear that war bears a deeper cost than just simple statistics. That lives that are lost are not the building blocks of a better future but real people as deserving of life as anyone. A lost son, father and brother are unfulfilled lives and the cost is best seen in the futility of war. I’m thinking about the construction of a poem. How the poet starts with an idea, a head full of thoughts and emotions, descriptions and metaphors. All this is got down onto paper. It is revised. All that is excess is removed. It is stripped down and stripped down. The pellets in the scattergun are removed one by one until there are only a few. These are melted down into a single, rifled, bullet. This story about relationships between men in war is like that; stripped down to a rifle, a coat, a b I’m thinking about the construction of a poem. How the poet starts with an idea, a head full of thoughts and emotions, descriptions and metaphors. All this is got down onto paper. It is revised. All that is excess is removed. It is stripped down and stripped down. The pellets in the scattergun are removed one by one until there are only a few. These are melted down into a single, rifled, bullet. Beautiful captured moments between a group of soldiers who are waiting for the next battle. While the story is plotless, chapters and sentences are short, written in simple prose, the final effect is the opposite of this modesty. Rich in emotions, but without sentimentality, and while this story is set in wartime it is (almost) without battlefield. Elegant and absorbing. An insight into to the feelings and companionship of soldiers waiting and waiting to be ordered to march and to fight. Well written, flowing style making enjoyable read. I would give this 3.5 stars. FOUR SOLDIERS is a very simplistic story of four young men in the red army during the Russian Revolution. The novel tells about their friendship and their fears. A short but powerful book! The is the second translation of the French author’s work into English the first came out only five years ago with A Meal in Winter which is also a powerful and haunting novella dealing with the cruelty, brutality and sheer senselessness of war. Four Soldiers was infact written a decade earlier but its translation into English has been delayed until now. Although the story is set on the Romanian front during the Russian Civil War of 1919 it has a universality and timelessness about it that can b The is the second translation of the French author’s work into English the first came out only five years ago with A Meal in Winter which is also a powerful and haunting novella dealing with the cruelty, brutality and sheer senselessness of war. Four Soldiers was infact written a decade earlier but its translation into English has been delayed until now. Although the story is set on the Romanian front during the Russian Civil War of 1919 it has a universality and timelessness about it that can be applied to armed conflict throughout the ages. The story centres around four illiterate soldiers of the Red Army, Pavel, Sifra, Kyabine and the narrator, Benia. They have taken up a position with their army unit in the forest during the freezing winter awaiting for the weather to improve before they must move away to face the inevitable fighting. The four have isolated themselves from the rest of the soldiers and here hiding out in the forest they keep themselves occupied by playing dice in an abandoned railway station and scavenging. Rituals are undertaken including taking turns to sleep with a watch that contains a photograph of a woman that has been looted from a soldier. A pond is discovered by them which they keep secret from the other soldiers and which becomes an integral part of their daily existence. All the time the four soldiers bond while passing the tedium that is an inherent part of warfare, the endless waiting around knowing that ahead lies death and destruction and the psychological effect that this has on the fighting men involved. The four soldiers are joined by a new young recruit and when they discover that he appears to be literate they ask him to write about their experiences with their pond and the meaning it has to them. They require above all a record for posterity. With the passing of winter the soldiers must leave the forest and say goodbye to the pond for ever and it is not long before they encounter the enemy. Not all will survive and there is a revelation that will haunt the reader for a long time to come. Short, stark, beautifully written book of, as the title tells, four soldiers in the Red Army during the Russian Civil War, 1919. The author deftly builds tension and the uneasy threat of violence. This is the 5th of the 13 books on the MBI longlist that I have reviewed. It is a quick read but far more complex that its simple structure might lead one to think. This is the story of four soldiers (and, for awhile, a boy) in the Red Army in Eastern Europe in WWI. One of the soldiers is the narrator. He never tells us his name. The story starts when he leaves his job and joins the army. He tells us he fought on the Romanian front but that in the summer we fled from the Romanians. While his reg This is the 5th of the 13 books on the MBI longlist that I have reviewed. It is a quick read but far more complex that its simple structure might lead one to think. This is the story of four soldiers (and, for awhile, a boy) in the Red Army in Eastern Europe in WWI. One of the soldiers is the narrator. He never tells us his name. The story starts when he leaves his job and joins the army. He tells us he fought on the Romanian front but that in the summer we fled from the Romanians. While his regiment is fleeing he meets Pavel, another soldier in the regiment, and they decide to stick together. Then another soldier - one who is big and strong but not so bright - moves in with them and they do not object, so Kyabine makes three. In October it snowed and we waited in a factory for our orders. When they arrived, our commander brought us together and told us that we had to leave the front and retreat into the forest [and] … build huts and wait for spring. They reached the forest in November and Pavel came up with a hut design but they needed another man to build it. Sifra Nedatchin was asked. He was very young and good shot, and he owned calvary boots. We'd never heard of him having any trouble with anyone about anything." Sifra says yes and now there are four. They build the hut and the narrator thinks to himself: That's it. I'm not alone in the world any more. And I was right. The narrator tells us little about that cold winter in the hut. Then it is spring. The huts are burned and the regiment moves out of the forest. The narrator tells us: As we walked away from the fire, I spoke in my head to my parents: Look at me, you don't have to be afraid for me any more because I survived the winter and I have comrades now. Soon the regiment settles down in a camp and tents are erected. Once again Pavel's planned a superior tent structure and the four soldiers settle in. They play dice. Kyabine continues to lose all his tobacco in the dice games. They find a pond and keep it secret from everyone else. Pavel has nightmares and wakes the narrator to be with him. Pavel would, good naturedly, tease Kyabine. Sifra declines his turn with the watch with the beautiful woman's picture. Days pass, things happen -- a food expedition, blanket washing, and a horse amongst them. A young boy - Ermakov, referred to as "the Evdokim kid" - is put into their tent against their wishes. The Evdokim kid turns out not to be a problem. He spends a lot of time writing, and they tell him things to write. Then comes word that they are to leave camp and advance. The group is distraught. Kyabine asks if they can continue to stick together and is told yes. But he worries. Pavel suggests they just stay at their pond, but Kyabine cannot get his head around that, and Pavel does not push it. Back at camp they wait together the last hour before it is time to leave. The narrator laments: I wanted this hour to be over and us to be marching because all four of us were sad and lost and we were so afraid. And if I'd known, I'd have taken all three of them in my arms and then they'd have been so embarrassed , and God, so would I, but having said it, having suddenly thought it, I have the impression that I actually did it and now I'm even sadder. They leave and in a day or so are under fire. The narrator describes the march and the fight and then the book ends with the narrator, in the last paragraph, thinking back. This was an interesting novella set in 1919 as Russian troops fight the civil war post revolution. That being said there is little to distinguish the actual conflict which perhaps is apt given that this is a book about the universality of a soldiers experience and particularly their comradeship when in a period of lull in the fighting. So as winter approaches a division has to make shelter in the woods until the spring. the four soldiers and eventually one of other are a diverse bunch who make t This was an interesting novella set in 1919 as Russian troops fight the civil war post revolution. That being said there is little to distinguish the actual conflict which perhaps is apt given that this is a book about the universality of a soldiers experience and particularly their comradeship when in a period of lull in the fighting. So as winter approaches a division has to make shelter in the woods until the spring. the four soldiers and eventually one of other are a diverse bunch who make there timber hut and discover a pond nearby. the book is about the friendships and how they cope including the interaction with local farmers, how they support each other through times of emotional distress in the case of the narrator and the war toughened Pavel who has nightmares that disturb him, exchages both cruel and funny particularly over cigarettes, and how much reliance in an object as a symbol of luck the soldiers hold (here a photo of a woman in a pocket watch). Longlisted for the 2019 MAN INTERNATIONAL PRIZE, I am not sure what to think of this book. Although a perfectly acceptable story of the relationships between the four eponymous soldiers developed during the winter between active fighting, it is not nearly as complex and literary as most of the other books on this list. In my opinion it doesn’t belong on the Shortlist. Four Soldiers is a remarkable little novel. Both poignant and funny - explores the importance of friendship in persevering against overwhelming odds. The simple writing style elevates both the horrors of war and the enduring friendship formed by the young men facing uncertainty and death daily. A worthwhile read for anyone who enjoys and appreciates the depth, desperation, and fundamental companionship of war stories. Four Soldiers by Hubert Mingarelli (translated by Sam Taylor) is a short novel taking about members of the Russian Army fighting the Russian Civil War in 1919. Mr. Mingarelli is a French writer, he won the Prix Medici prize in 2003 for this novel. The story is told by Benia, a soldier in the Red Army fighting in the Russian Civil War on the Romanian border. Together with his three friends, Pavel, Kyabine, and Sifra, they spend a boring winter in the forest trying to stay busy by gambling, sleeping, and trying to feed themselves. When spring arrives, the lull in the war is over and the four friends march into battle. This book is a portrayal of four simple men waiting for boredom to break so they can go into battle. Much of the book is spent examining the psychological affects that boredom has on men who are waiting for a fight. This is a short book, and slow with very little action, simply written and direct. I found the story of this rugged crew of soldiers by choice and circumstance to be haunting and simple. The story, written from one perspective, could have been easily been told in diary form. A short easy read, kind of simplistically written (or maybe it just translates that way?)... it was interesting enough though, even if kind of at a slower pace.... It follows 4 young Russian soldiers marching along with their infantry company in 1919 during the Russian Civil War, & how they spend their time awaiting battle/fighting. It explores their fears/concerns, camaraderie, making good use of time & wasting time...just how young men/boys might get along during such an experience. I A short easy read, kind of simplistically written (or maybe it just translates that way?)... it was interesting enough though, even if kind of at a slower pace.... It follows 4 young Russian soldiers marching along with their infantry company in 1919 during the Russian Civil War, & how they spend their time awaiting battle/fighting. It explores their fears/concerns, camaraderie, making good use of time & wasting time...just how young men/boys might get along during such an experience. I enjoyed it, & liked the shorter length too.....it was well worth the time to read it. I'd recommend this to anyone who likes a quick historical fiction. There were definitely some idyllic and lyrical passages in this tale of four soldiers who reluctantly accept a young recruit into their tent. They become more attached and obsessive when they decide that the youngster may be able to document their occasional moments of respite in their often grim life in his habit of daily diary entries. There is only the briefest of introductions about the Russian home towns of the four soldiers and their young charge and there is only the occasional use of firearms throughout the plot. This sets a stage that is almost timeless, where the soldiers could be in any army in any place at any time. Before the child soldier is introduced there is an over-wintering period in a temporary hut which the soldiers build themselves. Although the squad is subject to occasional orders about foraging and eats collectively at an army kitchen, they often seem to be acting without any supervision or command. Brief references are made to this being the Third Army on the side of the Reds in the Russian Civil War (1917-22) and that they are fighting on the Romanian Front, but there is little actual military action involved except for a retreat at the front end and an engagement at the back end. My expectations may have been at a bit too high for this novella, based on its previous French literary award Prix Medici (2003) and its current long-listed nomination for the 2019 International Booker Prize. With that knowledge and the synopsis I started to imagine something along the lines of Tarkovsky's Ivan's Childhood. I had to come down to earth a bit on that and just accept it as a tale of four everymen trying to establish their own microcosm of peaceful existence within a grim war-torn world with the desire to have someone who would document it to prove that it ever existed. Four Soldiers is set during the Russian Civil War in 1919, somewhere on the front near Romanian and as the title tells us, there are four soldiers as part of a company of the Red Army who have been ordered to the woods on the borders with Romania waiting for orders to decamp. There is the narrator from Kirov (well the city now known as Kirov), the intelligent Pavel who has made plans for the their hut for sleeping so that they are protected, Uzbek soldier Kyabine, a guy who really shouldn't gamble his tobacco in games of Dice as he doesn't win (a thought while reading is how can you lose so many games of Dice, which would be a game of chance?). Kyabine reminds me of lenny from Of Mice & Men, he is a very strong, diligent hardworker but not clever and then there is the quiet sifra who can put a gun together with his eyes closed. Threre is a guardedness to them when forced to take on a fifth soldier to their hut by the Lieutenant, a young teenager enlisted from the Lake Ladoga area but after they realise he isn't going any where, there is a paternal protectiveness towards the new recruit. the conditions are hard but with the help of each of the four working together in the base, they have made the best of what they can. For example, at there hut they have used tins to protect from rain and when they had been in retreat from the Polish front, they got a tarp for protection. The narrative is minimalist and Taylor's translation is similar to his superb translation of David foenkinos' Charlotte. There is a really good restraint to it and it works really well in this to create the feeling that as well as the reader, the soldiers in the sense of them waiting for orders but wanting to take it easy. As the song goes, the waiting is the hardest part. .
another quote was from the war series generation war, the line being about after a while fighting for your friends and i got the real sense that the four soldiers main purpose now is not the cause of socialism, socialism never being mentioned, but they have stuck it out for each other, to be there for them. I thought this was a superb novel and finished it in one day (it is also only 150 pages. Wow, this is a fantastic short work, and I honestly couldn't put it down. It is a very minimalist work, basic and to the point but capable of conveying a great deal of feeling and "soul." The story is very basic. The titular four soldiers are the smartass but haunted Pavel, the mighty but childish Kyabine, the quiet and sensitive Sifra, and insecure narrator Benia, as well as the Evdokim kid, the shy new volunteer. No great battles or glorious charges are to be found here, nor any pretentious po Wow, this is a fantastic short work, and I honestly couldn't put it down. It is a very minimalist work, basic and to the point but capable of conveying a great deal of feeling and "soul." The story is very basic. The titular four soldiers are the smartass but haunted Pavel, the mighty but childish Kyabine, the quiet and sensitive Sifra, and insecure narrator Benia, as well as the Evdokim kid, the shy new volunteer. No great battles or glorious charges are to be found here, nor any pretentious politicizing. Just a handful of comrades enjoying a series of "good memories" as they wait to be sent back to the war where there are no "good memories." It is all simple, matter of fact statements by characters with no grand eloquent ideals, although that does not mean that they are incapable of introspection and intense moments of feeling. This work reminded me of that short section of All Quiet on the Western Front where the soldiers are all behind the lines and away from the war, just laying in the sun, in "Four Soldiers' " case next to their pond, not thinking of death and destruction. Of course the war and it's themes are always lingering over the story and pick away at the edges of their happiness. Honestly, I really don't know what else to say. The book is superb and I am excited to see what other works Mr. Mingarelli has crafted. Someone else reviewed this book as haunting, which is a perfect description. It is told by one of the four soldiers, they are a ragged crew that met up while trying to get away from the Romanians. The writing is exactly as if you were listening to a soldier, not well educated, rather simple. I wouldn’t say it was an enjoyable read, it is fairly short and almost reads like a diary. Simple is another word to describe it, there really isn’t a plot and the ending basically leaves you hanging. It doe Someone else reviewed this book as haunting, which is a perfect description. It is told by one of the four soldiers, they are a ragged crew that met up while trying to get away from the Romanians. The writing is exactly as if you were listening to a soldier, not well educated, rather simple. I wouldn’t say it was an enjoyable read, it is fairly short and almost reads like a diary. Simple is another word to describe it, there really isn’t a plot and the ending basically leaves you hanging. It doesn’t really cover any events of the war, it just covers the day to day life of their existence as life was difficult and challenging as a soldier. This one is really hard to review, some people may absolutely love it, and find it enthralling and poetic, not so much for me. I did want to finish it, but it did not bring out a lot of feelings one way or the other for the characters. A few of the things that happened I would consider rather odd. A war novella with about two pages of war in it. The bulk of the book is a fascinating and even often tender look at the bond four soldiers (and later a fifth, a young enlistee) share with each other while waiting for spring to arrive and with it the inevitable advance back into battle. This basically becomes the record, the journal, of four unknown soldiers. The details of their time, and how they passed it together, is the entire book. The attention to those details, and the interaction between A war novella with about two pages of war in it. The bulk of the book is a fascinating and even often tender look at the bond four soldiers (and later a fifth, a young enlistee) share with each other while waiting for spring to arrive and with it the inevitable advance back into battle. This basically becomes the record, the journal, of four unknown soldiers. The details of their time, and how they passed it together, is the entire book. The attention to those details, and the interaction between these very well drawn and developed characters, lends well to the idea that it’s an examination of the human condition. But it’s more deft, and less grand than that. It’s a story first and foremost, and so it’s a bit of a paradox that so much realism and truth can be forged from Mingarelli’s fiction. It’s his excellent instinct that allows larger themes and talk of human condition to simmer underneath.